I'll admit, it has become entirely too easy, to bag on one Alex Rodriguez. It has also come to the point that this man, who could very easily go down as one of the most statistically dominant sluggers of all time, will also go down as one of the most unlikeable. With the newest steroid allegations attached to Alex, the story gets worse. As a Red Sox fan, I don't care if this guy gets ripped by anyone and everyone, but as a sympathetic blogger, we've got to start giving this guy a break or at the very least, attempt to. Since not many share my sentiment, I'll go first. Texas Rangers owner, Tom Hicks, deserves to shoulder some of this blame. Who else has their name on that contract which made Rodriguez the highest paid athlete in the world? In the off season of 2001, the then free-agent shortstop, formerly of the Seattle Mariners, inked a deal that would give him $252 million dollars over the next ten years. Over the next three seasons, Alex Rodriguez would play in 485 of a possible 486 games, smash 156 homers, and drive in 395 runs. However, to us, because the Rangers were never a serious threat, Rodriguez' time in Arlington, wasn't successful. Yet I ask, really? 52 long balls and 132 runs batted in per year is a failure? The Rangers owner, who needed to have Alex Rodriguez, and made sure to make him an offer he couldn't refuse, gets away clean? It isn't A-Rod's fault that ensuring one player $20 million plus, a player who doesn't pitch and bats on average four times a night, isn't the best way to allocate funds. It isn't A-Rod's fault that he got the best possible deal he could, you tell me that you won't take the promotion when it pays you $20 million a year. I'm positive that Alex driving in 130 runs and smacking 50 homers a season was the most he could do, which is probably better than anyone could have done. But somehow he's the bad guy? A-Rod didn't go crying because the Rangers couldn't get a pitcher worth salt, oh no, that was Tom Hicks who decided to part ways with his $252 million dollar man. So before you rip into A-Rod for being paid like a king, remember his signature is only on the back of the check, there is another on the front. Okay, Okay, I get it. He should only be paid like that if he can come through 100% of the time, that means in the "clutch." Do you realize what efforts are made to get you in "the clutch?" You have to produce for 162 games of the lengthiest of regular seasons among professional sports. 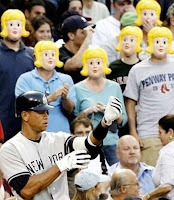 Since we are talking about Alex Rodriguez, this is something he does, no doubt. The three-time MVP is 33 years old and hasn't had a season in which he hit under 35 home runs since his second full season in the major leagues, that was in 1997. Your telling me one of his 553 career home runs in 15 seasons wasn't clutch? Or how about his 1,600 career RBI, all those men on base didn't think A-Rod was clutch when they crossed home plate off the end of his bat? Eleven straight seasons of 100 RBI or more, twelve in his career, but you want more? How about nine seasons finishing with a batting average over .300? So the guy hasn't been as successful in the playoffs, I'm guessing those teams he played for in the regular season weren't as successful, maybe even missed the playoffs, if A-Rod hadn't been so dominant at the dish. But you think because he makes more than everyone else, he should shoulder the bulk of the blame for his teams not coming through in the playoffs. That is irresponsible. How about we leave it at, Alex doesn't handle pressure as well as others, say Michael Jordan, Tiger Woods, and John Elway. Then again, they define the word clutch and not very many of us are in their league. What?!? You think Alex is the only professional athlete to cheat on his wife, hang around celebrities, and have some personal demons? Magic Johnson contracted HIV, Karl Malone has children who he doesn't even speak with, but all A-Rod did was take home a stripper on a road trip, you tell me the difference? I don't condone cheating on your wife, if you have an addiction to strip clubs and their employees, maybe you should refrain from tying the proverbial knot. This guy got caught cheating on the front page of every newspaper in the city of New York, that's not a little unfair? You have to ask yourself, with Michael Phelps smoking a bong, Matt Leinart holding a funnel for co-eds, and Alex Rodriguez taking a stripper home, when do we stop using our journalism skills for tabloid gossip? When the camera phone is in your hand, where is your moral compass? Do you think your mother, sister, wife, or any woman or man in your life would be proud to know that you've become paparazzi? Do you also think you haven't done one of those things when you probably shouldn't have? How would you feel if your personal life was exploited in black and white on every newspaper in the largest city in the world? You probably don't care, all you can see is greenbacks, because these athletes who have physically put more work into their job than you ever will, it doesn't mean anything to you, but rather than doing actual journalistic work, you sell a picture to a tabloid and cash in. Yes, the athlete or celebrity shouldn't be doing what they are doing, but do you think they are the only ones who get hurt by your "work"? You participate in those children being disappointed by what Mike Phelps did at a party, you publicly embarrass A-Rod's wife, again, do you think the only one your screwing over is the athlete? Get a grip, A-Rod is as human as the next guy, he makes mistakes, feels insecure, and goes through divorce, and I pray you go through the same thing someday, give yourself a little perspective. I've never been a fan of Alex Rodriguez. When he was in Seattle, I cheered for Junior. When he signed with Texas, he was in the annex as far as I'm concerned. When it looked like he'd be playing third and batting fourth for the BoSox, I couldn't have been more excited. Then he ended up in New York, and naturally I disliked him a little more. All that said, he adds something to the rivalry that is the greatest rivalry in professional sports, he gives us a superstar that is unlikeable. He scares you every time he gets up to the plate with runners on or off the base paths. But we've got to stop with this guy or at least tone it down, he didn't sleep with your wife, he hasn't said a word about his former manager who has seemed to want to throw his legacy away, and if he has taken steroids, tell me a home run hitter your 100% confident that they didn't. I'll never cheer for A-Rod, I just couldn't do that contractually, (loyalty lies in Fenway) but why does this guy have to endure all this while he goes through a divorce, fights allegations, listens to a former manager bash him, and constantly be compared to the player playing 10 feet next to him? The whole smash Alex routine is just tiring. MOVE ALONG! Warming Up: KEEP IT REAL! All Juiced Up: Keep It Real Friday! Got A Coach, Now What?